The MMF Industries fully automatic counterfeit detector does not require users to have full-authentication knowledge. It's detection features include UV, MG and IR scanning. It's the smallest detector on the market, allowing it to fit almost anywhere. 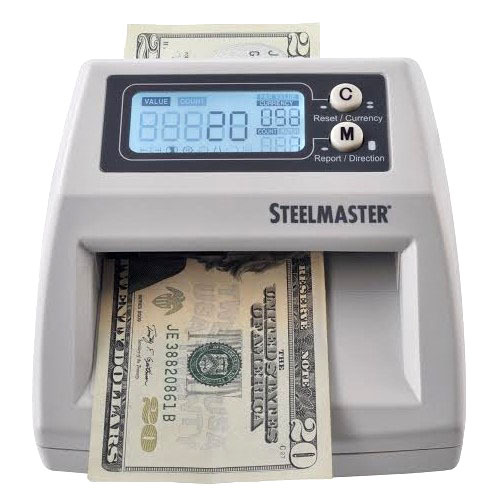 It accurately recognizes denominations and authenticates bill in less than one second. Dimensions: 4-3/4" W x 2-1/4" H x 5-1/4" D. Shipping weight is 27-1/4 lbs. The MMF Industries fully automatic counterfeit detector does not require users to have full-authentication knowledge. It's detection features include UV, MG and IR scanning. It's the smallest detector on the market, allowing it to fit almost anywhere.